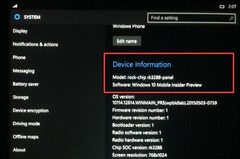 A 10-inch Rockchip RK3288-powered tablet has been allegedly spotted at Computex running Windows 10, so it looks like Microsoft's next-gen OS will also support the ARM architecture. Rockchip processors usually power low-end tablets and TV boxes, sometimes Android-powered smartphones as well. Earlier this year, the Chinese chip maker finally entered the laptop market with the first Rockchip RK3288-powered Chromebooks. The next logical step would be Windows, and it looks like Windows 10 has been spotted running on Rockchip tablets already. According to PadNews, a low-end tablet with a 1,024X768 pixels display and a Rockchip RK3288 processor under the hood has been spotted at Computex 2015 in Taipei. They also have a photo to prove it and, if this not a fake, this is the first time a Windows 10 device with a non-X86 architecture shows up in public. The tablet runs Windows 10 Mobile Insider Preview and has 1.5 GB RAM, as well as a 10-inch display. 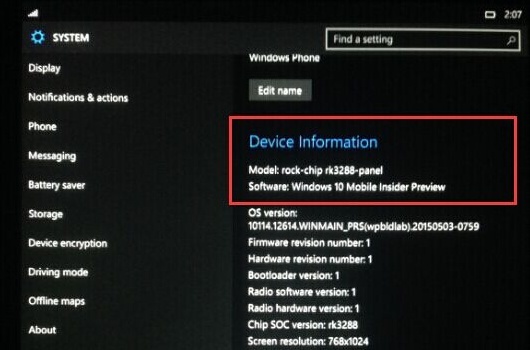 Windows 10 Mobile will not launch at the end of July, so there is enough time for Microsoft to make it fully compatible with Rockchip, MediaTek, Samsung, or Allwiner chips until it gets out later this year.